Space is limited to 20 students per class. Please join the CPS Tangent team for a quick look at row spraying established white clover. The tour is Wednesday May 21st @ 4pm. The plot in on the corner of Roberts rd and Boston Mill rd, just east of Shedd. We are going to look at 5 different chemicals and 2 different row spray timings in the spring to create rows in established white clover. Drones have been in the media a lot these days, pickup any agriculture magazine or on occasion see a clip on a major television network and UAV’s (Unmanned Aerial Vehicle-“Drones”) are being touted for their uses in capturing imagery on crops and used in precision farming application. The legality of flying UAV’s is questionable at best, and we expect at some time in the future FAA will establish policy in the operation of UAV’s for commercial purposes. Aerial Imagery is not a new technology there are several ways to collect imagery either by satellite which is typically about 5 to 10 meter resolution or from a fix wing aircraft with resolution of 1 meter down to inches. 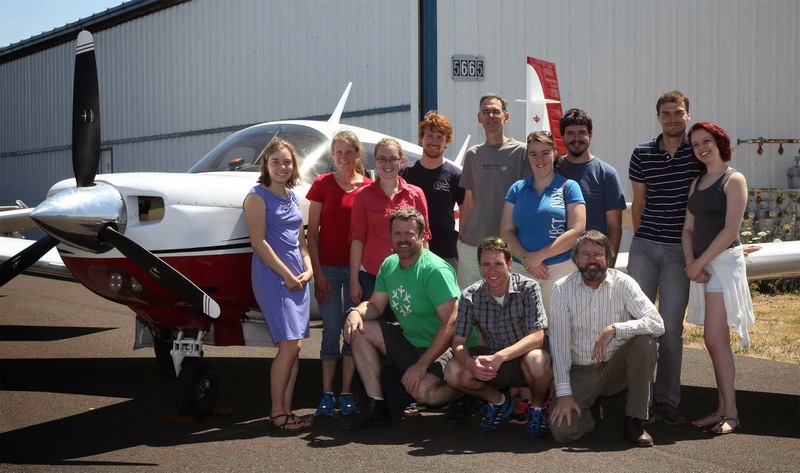 CPS has been working with Eagle Digital Imaging, a family business based out of Corvallis, since 2006. CPS first looked at vineyard imagery in the North Willamette Valley to identify vigor variability across the wine grape blocks. Later followed with spring imagery timing on Grass Seed with in the intentions to make variable rate applications of Plant Growth Regulators. 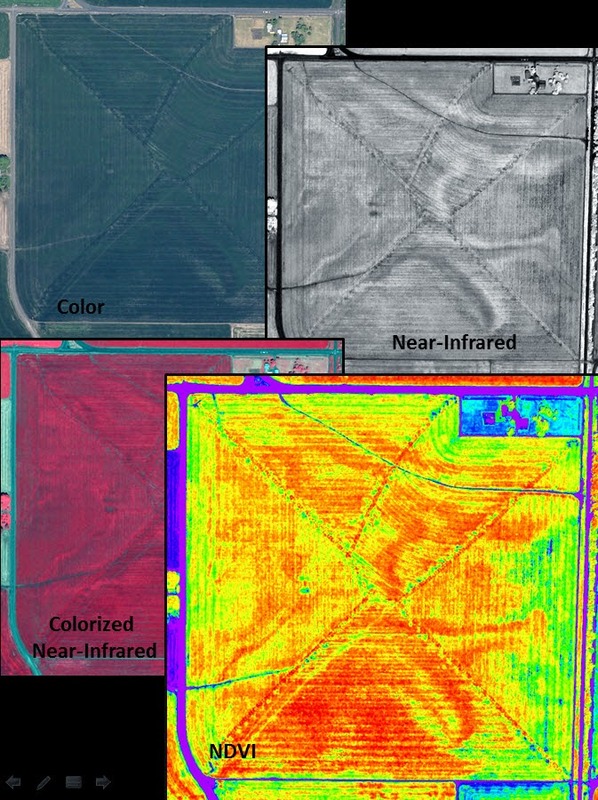 This was a great tool for us to create zone maps and establish rates according to crop health, vigor and crop density. Eagle Digital Imaging President David Shear, his wife Cheryl and son Colin, Director of Operations, along with a team of 9 employees are working on providing imagery on a new mobile platform to be used by fieldmen, growers and all interested parties. This new delivery method would enable users to evaluate images at the speed of business. Eagle Digital Imaging has the ability to act quickly with a fleet of 3 efficient Mooney aircraft and delivers a quick turn around on high quality images, but the ability to quickly view images on a mobile device out in the field or at the office gives users an edge in getting the maximum benefit from the data captured and a means of analysis of multiple imagery shots throughout the growing season. Also, considerations are being made to include imagery from historic sources outside of Eagle Digital Imagery and from UAV’s (drones) collections. 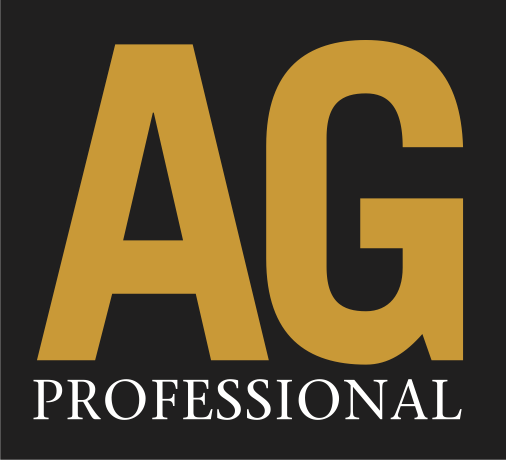 Please contact your fieldmen if you would like to know more about imagery applications or would like to capture imagery on your fields. Many of you may have read the article last year on the blog that described the identity of Stagonospora nodorum. On the head of the wheat plant it is commonly referred to as glume blotch. 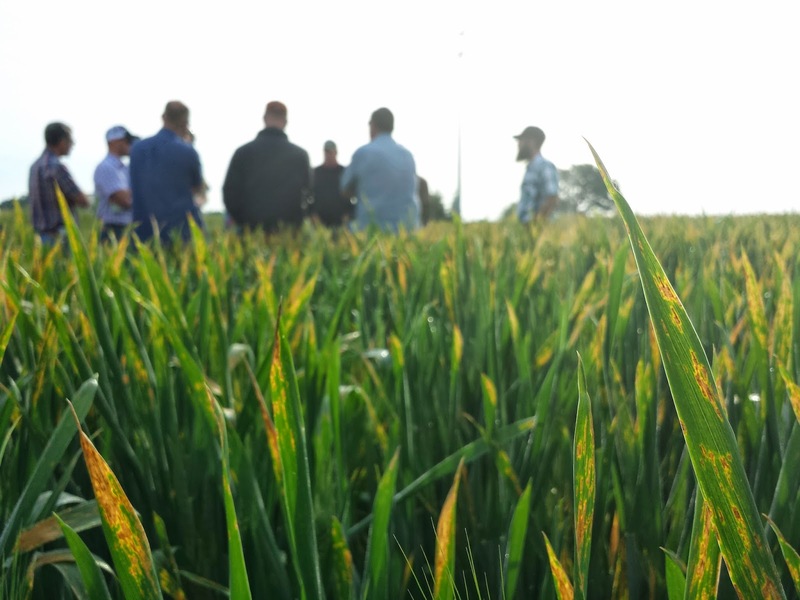 With the conditions we have experienced so far this season, we again are seeing and will continue to see large amounts of nodurum as well as Septoria tritici. 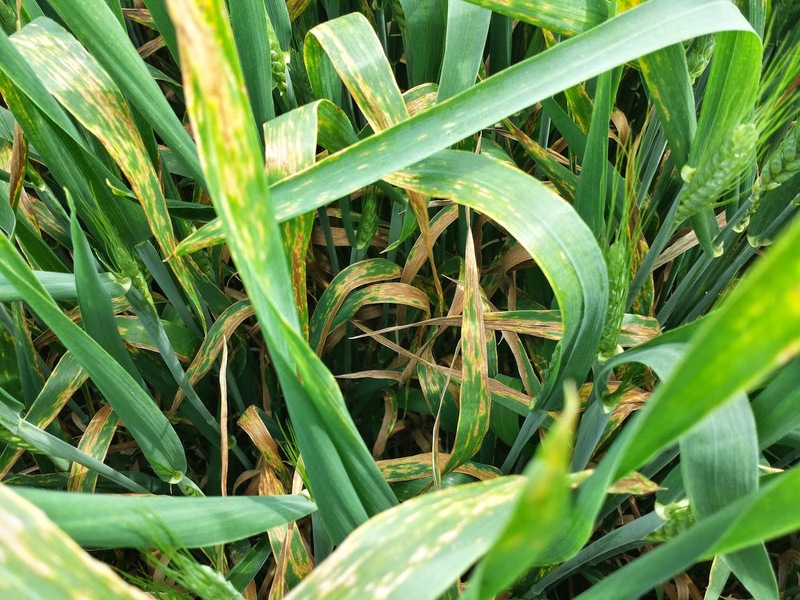 Septoria tritici is primarily a leaf pathogen, but it too can affect wheat heads. The Stagonospora nodurum commonly affects both foliage and heads. Both fungi can occur within the same field and on the same plants. 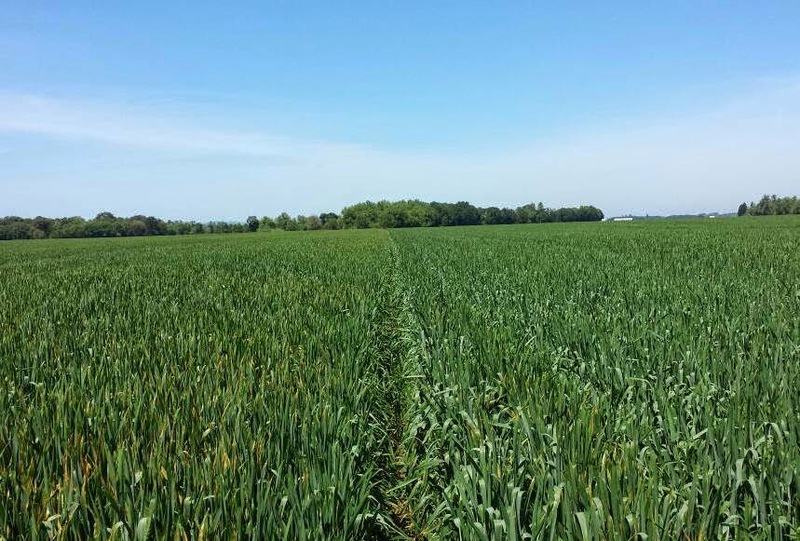 Yield reductions can be greater than 10-30% where fungicides are not used. Pycnidia are the spore producing structures of the fungus which in the case of S triciti are visible to the naked eye. They are most noticeable following periods of rain and dew and are spread in these wet and windy conditions. 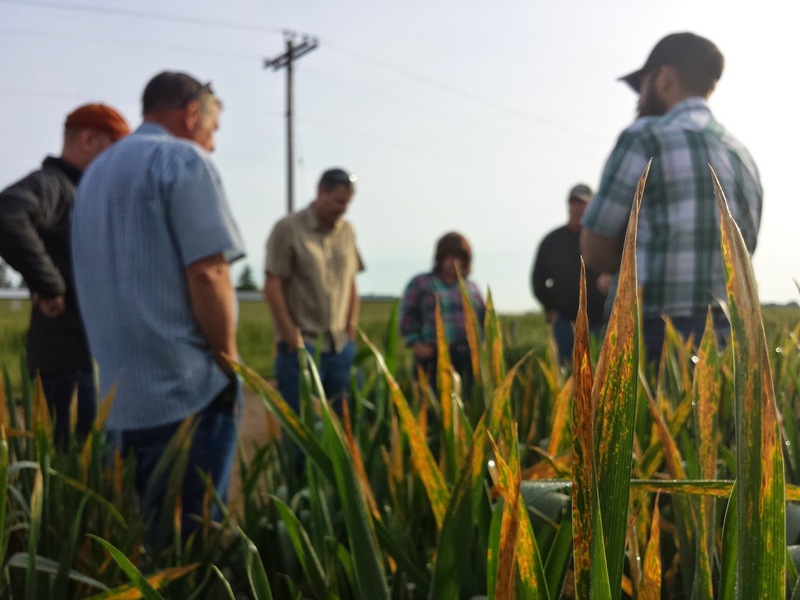 S. nodurum infections start as small dark brown flecks that expand into lens shaped lesions. Lesions are usually surrounded by a distinct yellow halo. The lesions have pycnidia also but are difficult to see without the use of a hands lens. 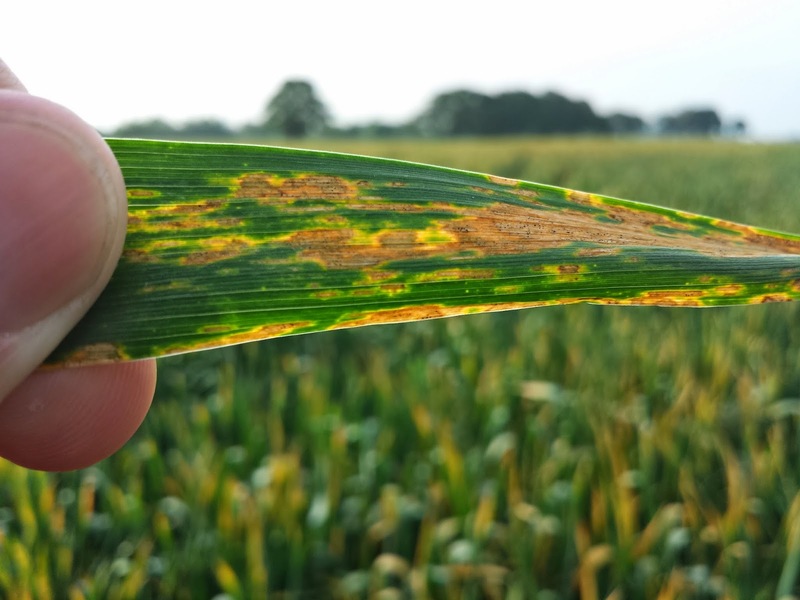 Lesions of both Septoria tritici and Stagonospora nodurum can rapidly expand and kill portions of leaves or entire leaves. 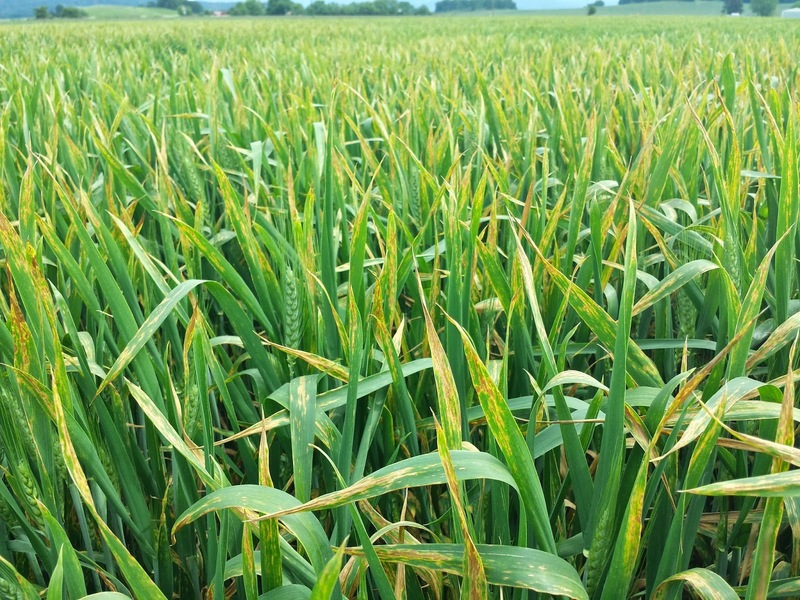 When one or both fungi invade the heads of wheat, the disease is referred to as glume blotch. Infection by tritici is highly dependent on temperature and cool wet conditions of which we have had a lot this year so far. 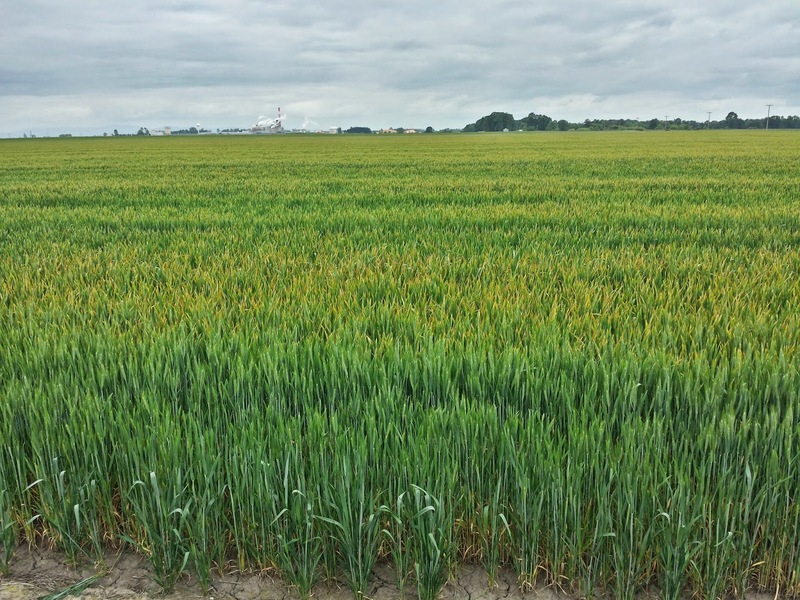 Some of the heavier seeded fields, with thick canopies of vegetation and high fertility have provided the disease with ideal conditions to be a problem. Infections start in the lower leaves of the plant and move up until high temperatures become limiting. 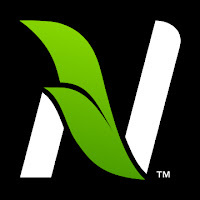 The Nodorum occurs over a wide temperature range but is highly dependent on the plant state of development. Infections increase about the time that plants are in the "boot stage" of development. 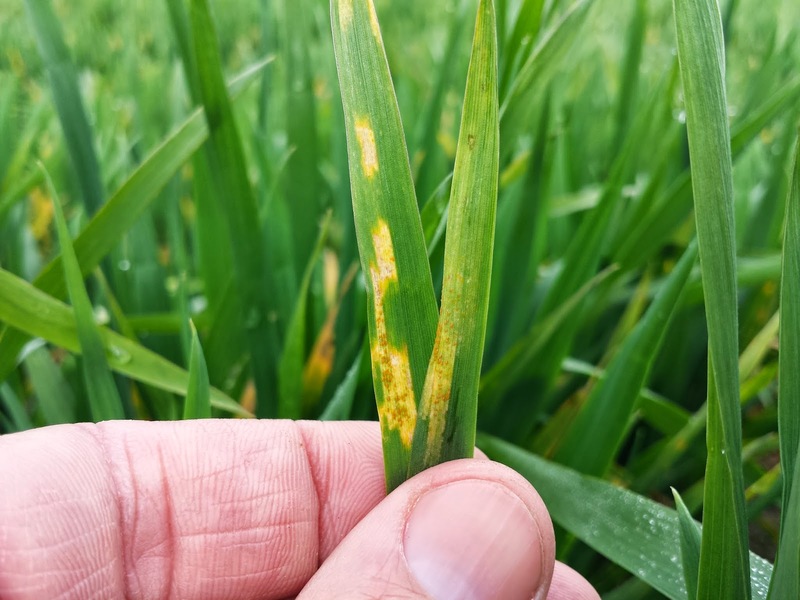 Foliar infections serve as a launching point to head infection which makes protecting the flag leaf especially important as well as the F1 and F2 leaves that precede the flag leaf. The wet and windy weather contributes to the spreading of the diseases whereas the dry weather tends to slow it or completely halt it. Timing of fungicide application plays an important role in determining the level of disease control. 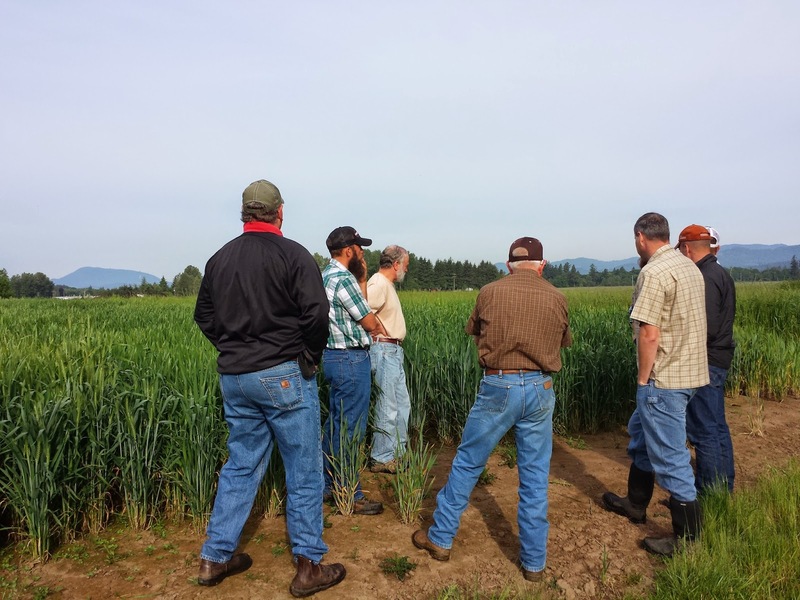 For the best results, scout your fields early and often to monitor the amount of Septoria tritici and Stagonospora present while at the same time paying attention to the weather trends and stage of plant growth for all varieties of wheat in the Willamette Valley. We received an email today from ODA regarding the approval of broadcast applications of various ZP Baits for vole control. Here is a PDF copy of the Grass Seed Advisory for ZP baits issued by ODA. The approved SLNs are linked below. ZP Ag Pellets Broadcast Application SLN (Bell) Motomco label here. 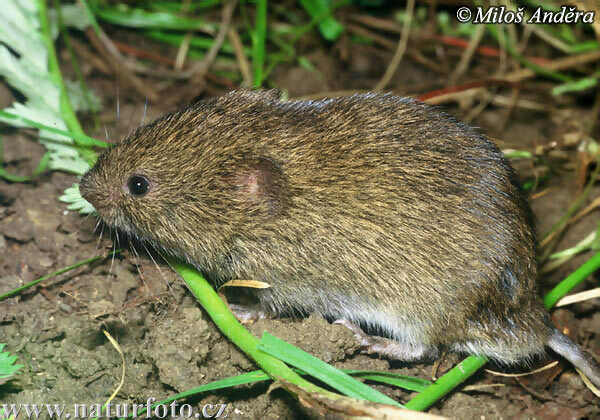 Since voles can be a very serious problem in our seed and grain production fields, it is very important that we continue to steward these products well. Please talk with your CPS Fieldman for more information on broadcast applications of ZP bait.